Keep your cotton shirts from shrinking with cold water and air drying. Cotton shirts never go out of style. Whether paired with skinny jeans or dressed up with a pencil skirt and blazer, colorful cotton shirts are endlessly chic. While cotton shirts are a wardrobe staple, keeping these tops from shrinking is a long-standing laundry problem. A new cotton shirt made from 100 percent cotton fibers will shrink minimally after the first washing if you avoid direct heat from a dryer. You’ll need a precise method to keep your tops clean and shrink-free. Pretreat stains with cold water and detergent. Before throwing your cotton shirts into the gentle cycle of the washer, place a teaspoon of liquid detergent on each stain. Place the cotton shirts in a basin of cold water. After 20 minutes of soaking, rub the stains gently with a small, short-bristled brush to lift the stain. Roll the shirts in a large white towel to remove water. Fill a washing machine with cold water on the gentle cycle. Place the cotton shirts with similar-colored clothes in the washer to prevent discoloration. Rinse the clothes by using a cool or cold washing cycle. Use minimal agitation in the washing cycle to prevent shrinkage. Remove the cotton shirts from the washing machine. Shake out wrinkles gently. Hang the cotton shirts on a padded wooden hanger to drip dry. Or, lay the shirts flat on a large towel in a well-ventilated area to air dry. 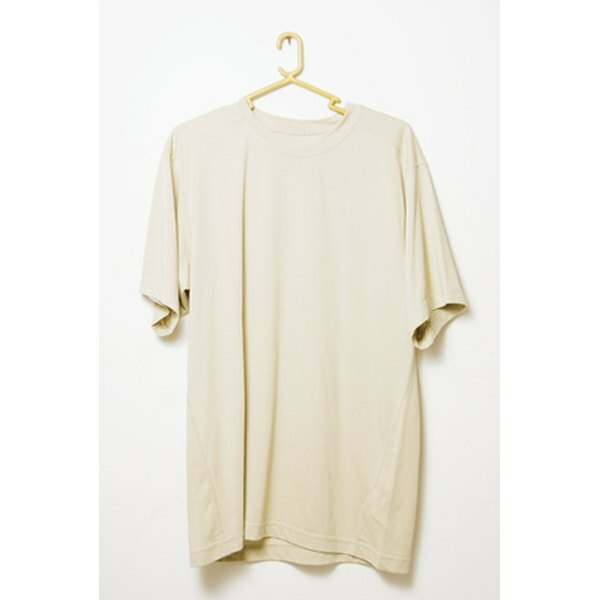 Use padded wooden hangers instead of wire hangers to maintain the shape of the shirt when air drying. If you must dry your clothes in a dryer, use a cool or air-dry cycle. Remove the clothes from the dryer before they are completely dried. Whether the cotton shirts are white or colored, the cold water helps to keep the clothes from shrinking. Always read the care label. If it recommends only to dry clean to preserve the color of the cotton shirts, take your cotton shirts to a reputable dry cleaner. Avoid a hot dryer or drying on a clothesline. Leaving cotton shirts in the sun for extended periods may cause the direct sunlight and heat to shrink your cotton shirts.